Now, I preface this post by saying I am not a Foodie. Don’t get me wrong, I enjoy a good meal like the rest of us but I’m sort of a picky eater, I’ve never been to a Michelin restaurant, and I’ve certainly never written a blog post centered around food before. There is a first for everything though, and I would be remised if I did not share my Montreal weekend itinerary with you. However, it just so happens that my itinerary is 90% all about food, so if you’re like me then this Non Foodie Montreal Guide is for you! Note, before you judge me- I visited Montreal during American Thanksgiving weekend so had no shame eating, eating, and more eating…but don’t worry, I was thankful. One may argue that breakfast is the most important meal of the day, and I’m not one to counter that argument. Montreal is known for have THE best bagels, better then NYC (gasp)! No two bagels are alike, and that is because each one is hand rolled before it is cooked in a wood fire oven to perfection. St Viateur Bagel has been making their delicious bagels since 1957, and you can visit their flagship store 24/7 to see and taste the bagel making process in action. In addition to the flagship store, there are multiple St Viateur Bagel Cafes throughout the city, which I would recommend if you’re looking for more of a sit down vs counter atmosphere. A short walk from St. Viateur, down Mont Royal St, you’ll find your next stop, Patisserie Au Kouign Amann. There isn’t a flashy sign, but one is not needed because you’ll smell the buttery goodness and know you’re in the right place. The pastry I recommend is the Kouign Amann, which if they named their bakery after it you know it’s good. Words and pictures can’t describe the buttery, flakey, caramelly layers of amazingness so you’re just going to have to take my word for it and try one yourself at this iconic place. “Who’s ready for lunch? !” I hope you saved room, because next up is the infamous Schwartz Deli. Just a block over from Mont Royal St is St Laurent Street, most known for its amazing street art. If you’re not hungry just yet, walk up and down the street admiring the art until you work up an appetite. At Schwartz Deli you’ll find there are two doors, one to a sit down restaurant and the other to the counter. We opted for the counter and was pleasantly surprised to find a few tables in the back looking out onto the street. The walls are decorated with news articles about the deli and there’s even a napkin wall where you can tack yours up, letting the world know you were at Schwartz eating the legendary smoked meat sandwich. After lunch, keep walking down St Laurent St (yay for more street art!) until you get to Square St Louis. It’s a nice little park with the most colorful homes, say Instagram! If you’re like me, and traveled to Montreal in the winter months I hope you brought a hat and gloves because let me tell you, you’ll need it! The best spot for a warm up drink, and also the spot where you are going to have to make your toughest decision of the day, is Juliette et Chocolat. Can you picture a 10+ page menu full of decadent chocolatey drinks all vying for your attention? Cue, hardest decision of the day here. For me, I kept my attention on the hot chocolate page, and yes there’s an entire page just dedicated to hot chocolate drinks. (Note- they also have an extensive milkshake menu if you opted to visit Montreal in the summer months.) There are a handful of Juliette et Chocolat locations sprinkled throughout Montreal so chances are when you’re in need of a warm up, there’s one nearby ready to welcome you with open arms! When you’re ready to leave downtown Montreal and transport yourself to a European Fairytale land, head over to Old Montreal. At one end is the Place de Arts, home of the beautiful Basilica Notre Dame, and at the other end is the lively square of Place Jacque Cartier. And lucky for you there are cute cobblestone roads in between full of adorable shops, food, and more food. 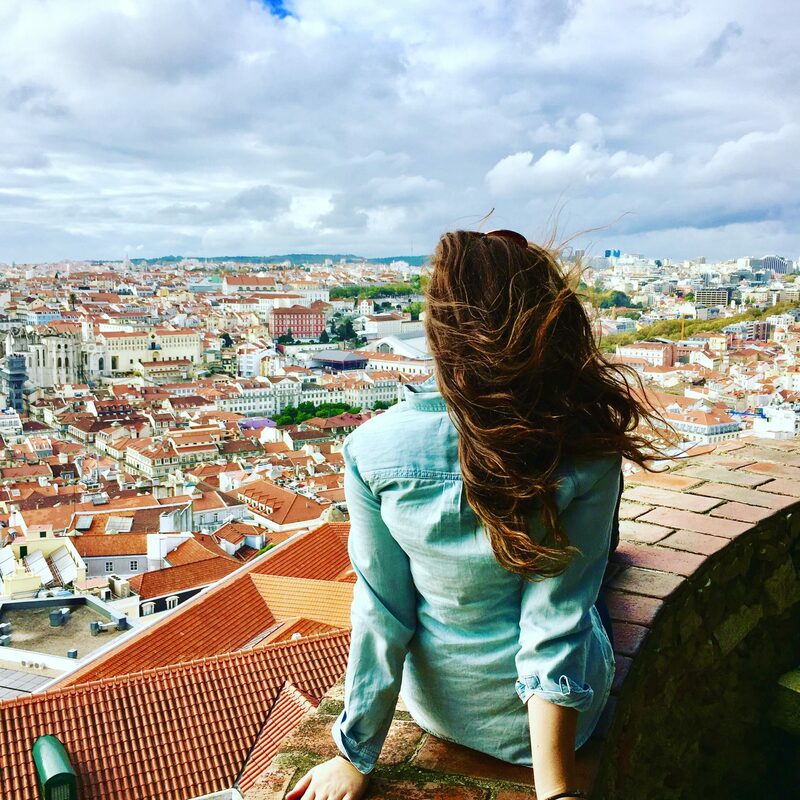 One of those cobblestone roads is St. Paul’s Street, and after an afternoon of exploring myself, I’m excited to share my favorite stops! Olive & Gourmando: If you’re looking for the best Brunch in Montreal look no further. Breakfast and lunch is served daily but they have a special brunch menu on the weekends. My recommendation is the seasonal French toast, because nothing screams winter more than warm cinnamon and spiced apples. 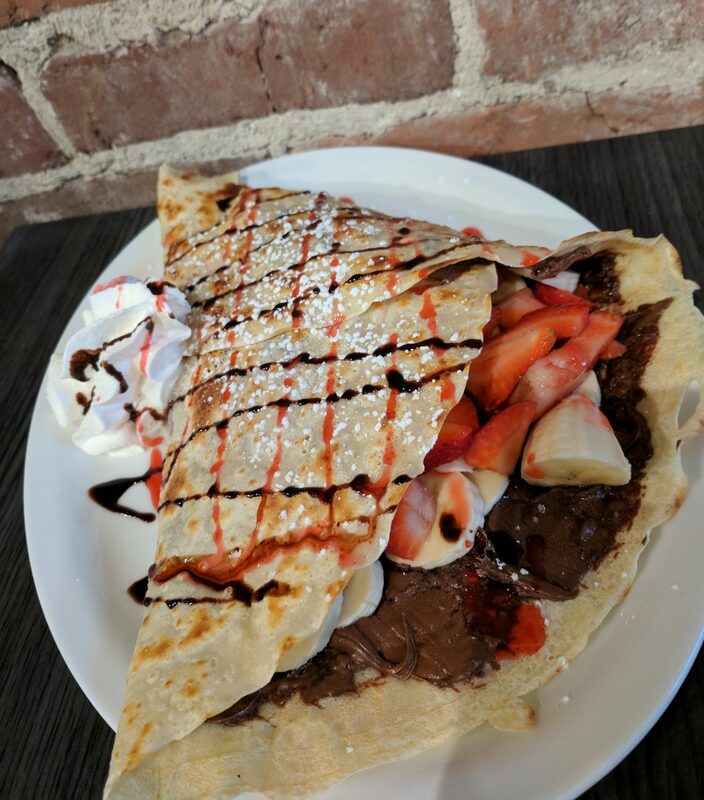 Creperie St Paul: Hands down the best crepe I’ve ever had, and I lived in Paris for 4 months so I’ve had a lot of crepes in my day… Nutella, banana, and strawberry is the way to go! Be sure to check out the gift shop next door too, you’ll find many homemade local items perfect for gift giving or unique souvenirs. Creperie Chez Suzette: I can’t speak for the Crepe’s here but the French Onion soup was heaven. Tommy’s: A charming café right out of Instagram, be sure to take a peek inside. If you’re hungry I’d opt for the grilled cheese, although everything looked #delicious. Le Petite Dep: This brightly colored store front is worth a visit inside too. Although it calls itself a convenience store, it is much more with a great local beer and snack selection, homemade ice cream, and a barista bar serving up café drinks. Bonsecours Market: Montreal’s main public market for over 100 years, this multi-story dome shaped building is located a block from Place Jacque Cartier. Basilica Notre Dame: As if the church wasn’t stunning enough, in the evenings they run a light show called “Aura” where the entire church comes to life. Although it is possible to buy tickets at the door, it tends to fill up so buy your tickets in advance if you can. Now, you may think I’m crazy that you just had lunch and now I’m telling you it’s time for dinner, but for the purposes of this post we are assuming you are always hungry! If you’re looking for something to do in between all these meals keep reading because there’s a section on other things to do soon! The Eaton Center is one of the best shopping areas in Montreal located on and under St. Catherine’s Street. After a long afternoon of shopping or as a pregame meal before hitting the night life, you have to eat dinner at Le Warehouse. Literally every item on the menu is under $5, and when I say every item menu I’m talking creamy mac n cheese, loaded potato skins, tacos, bbq, nachos…. my mouth is watering just reminiscing. Any guesses what the national dish of Canada is? If you guessed Poutine then you my friend are correct. I’m willing to bet that most of the restaurants in the city have a Poutine Dish on the menu, but La Banquise is the only one with over 30 different types, which is why you must hold off on ordering poutine until you walk through La Banquise’s colorful doors. If you aren’t familiar with the dish, it’s basically French fries, gravy, cheese curds, and in La Banquise’s case, whatever else you can image…from hot dogs to breaded chicken to guacamole let your imagination run wild! Now, I say to save this for late night only because they are open 24/7… and who doesn’t love a big pile of yumminess as a night cap? Now, I told you I wasn’t a Foodie, yet so far all I’ve written about was the food. So if you’re looking for some non food related fun in the Non Foodie Montreal Guide you’re at the right place! If you need to take a break from the food scene, the underground city is the perfect place! Note- if you don’t need a break still check out the underground city because there is food underground too. There are over 1600 stores across the 32 kilometers of tunnels connecting Montreal underground. I’d be lying if I said it was easy to navigate, but that’s what maps are for! Shopping: If you’re looking to shop, the Eaton Center downtown St Catherine St is the place. Ice Skating: Yes you heard me, there is an ice skating rink. Berlin Wall: Fun fact, there is a piece of the Berlin Wall underground Montreal, random I know! Seasonal Exhibits: Because who doesn’t love Santas?! Now one may argue that hikes and winter don’t mix, however I am so glad that we braved the cold and got to experience the city scape views that Mont Royal has to offer. Another fun spot to check out are Montreal’s markets, especially if you’re looking for a rainy day activity. They have everything from home grown produce, pure Canadian maple syrup, handmade musical spoons typical French boulangeries, smoked meats, plants, and even St Viatour Bagels. The most popular are Atwater Market & Market Jean Talon. Note- If you’re visiting around Christmas time, Atwater Market turns into a winter wonderland full of Christmas trees and seasonal décor, making it a must visit! They say a picture is worth 1000 words, so I’m just going to leave these here… and yes it’s as fun, if not more fun than it looks! Last but not least, and yes I put Tim Horton’s in its own category, you must stop in a local Tim Horton’s before leaving Montreal. If you are unfamiliar, TH is a Canadian Fast Food chain, with over 4600 locations throughout Canada. Whether you stop in for a quick coffee and a donut, or sit down and enjoy a soup and sandwich, you won’t be disappointed! So I think it’s safe to say i feel in LOVE with Montreal and I’m already dreaming of eating my way through this magnificent city all over again. Now it’s your turn, visit Montreal and report back on what I missed in my Non Foodie Montreal Guide! OMG I just ate and now I’m hungry again :)) that crepe though.. Oh my Lord. I would get on a plane and go there like now! After all that food it’s good that you suggested some “exercise” with the ice skating, hike and the axe throwing that looks like so much fun! I should have seen this food guide before visiting Montreal 😀 I loved the food there when I visited. I particularly loved the poutine (I’m Belgian so I loooove chips) and the smoked meat. Anyway, thanks to your guide I’ve discovered some other lovely dishes.